As you recall from Part One, I hiked the South Rim of the Grand Canyon in 2010 – the South Kaibab Trail down and the Bright Angel Trail up. Not easily sated, I returned two years later and tackled the much, much longer North Kaibab Trail. The North Rim of the Grand Canyon is a long way from anywhere. It is over 1,000 feet higher in elevation than the South Rim, and its northern exposure makes it a dumping ground for snow for seven months of the year (the North Rim is closed to visitors from mid-October to mid-April). The flora and fauna are different, too. The access road from the one-trick hamlet of Jacob Lake passes through terrain that looks like Yellowstone. 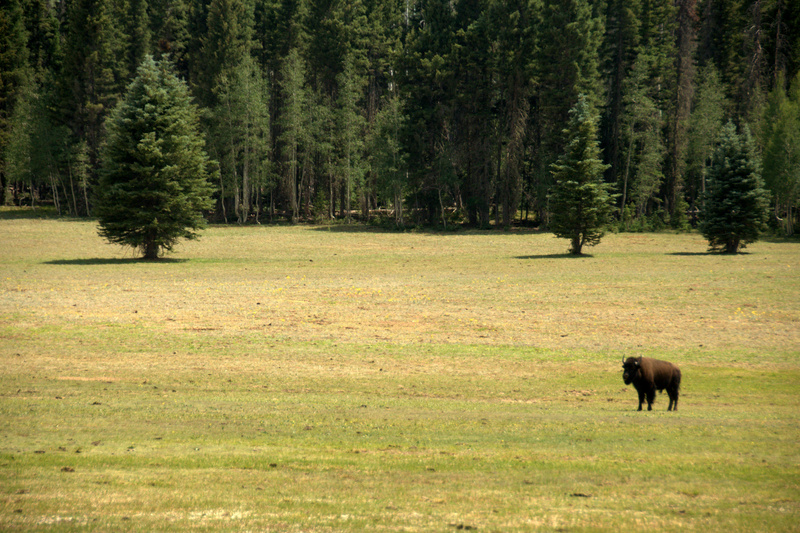 “Beefalo” – cow and bison hybrids – graze peacefully along the roadside, and sub-alpine meadows are home to wildflowers during the warmer months. The scent of pine is all around. 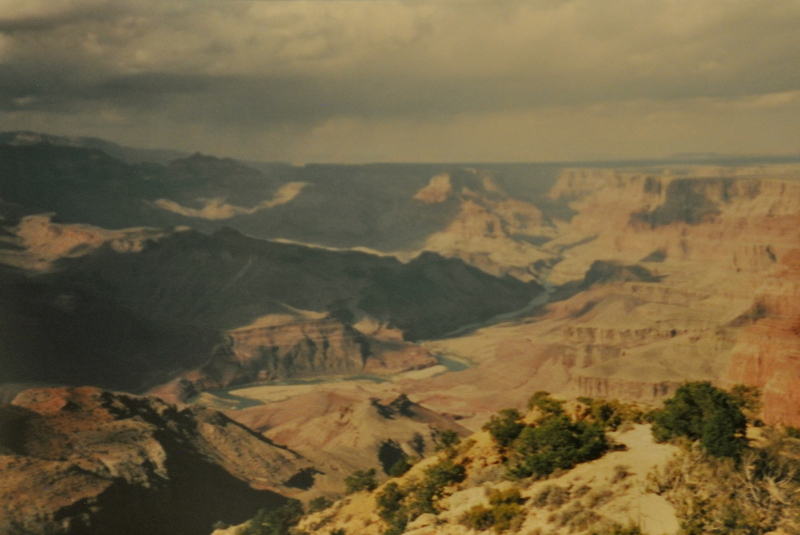 My first visit to the Grand Canyon was in October, 2000. It was little more than a two-hour stopover on my way from Chicago to Los Angeles, my first cross-country move. My friend Chuck came along for the ride. We took photos from various South Rim vantage points, hiked perhaps one-quarter mile down the Bright Angel Trail, ate at one of the Grand Canyon Village restaurants, and continued on our way. Still…the few pictures I took, including the photo above, taken from Hopi Point with my $60 manual camera, lent quite the inspiration, and I promised myself that I would one day return and hike all the way down to the canyon floor.